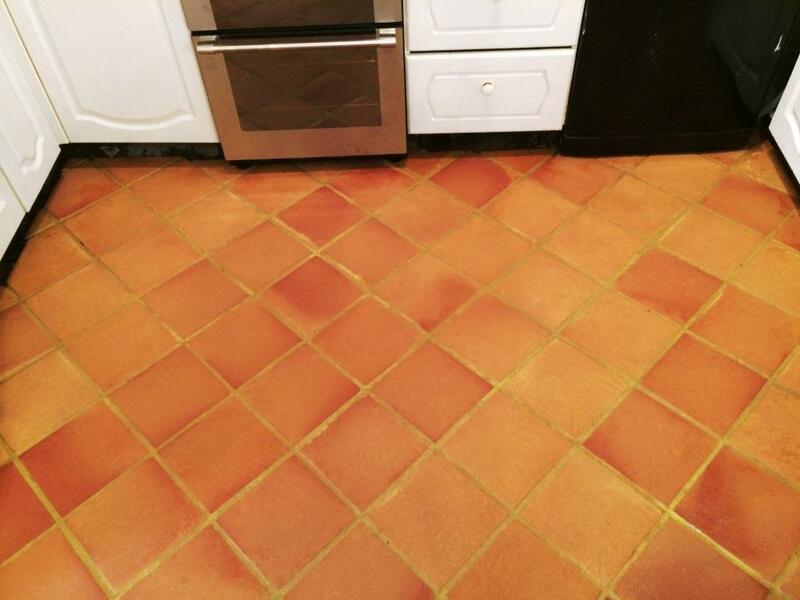 The owner of this Terracotta tiled floor installed in a house in the village of Osbourne St. Georges several years earlier contacted us as the floor had become ingrained with dirt and was now proving impossible to keep clean. We popped round to take a look and ran a small test clean to show what could be achieved, the test area came up really well and we were immediately booked to do the rest of the floor. 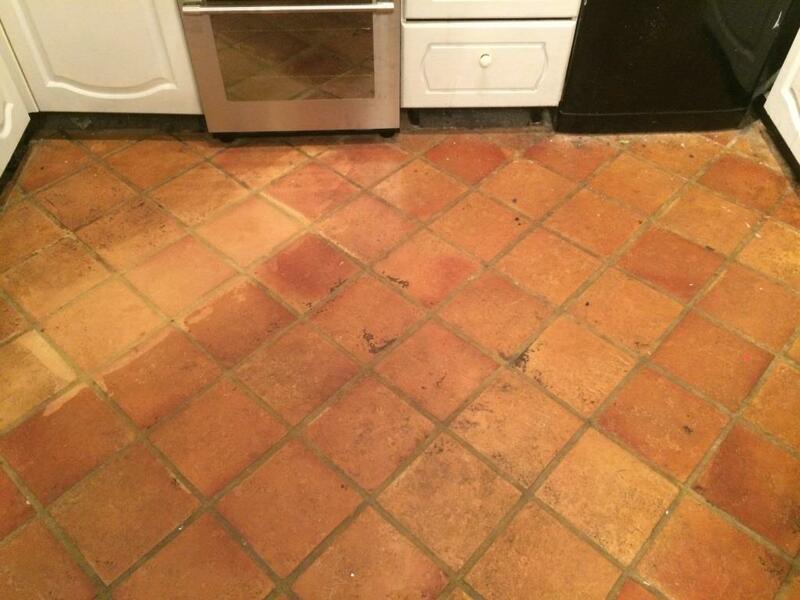 We started by smothering the floor in a dilution of Tile Doctor Pro-Clean and left it to dwell for about twenty minutes. Once the dwell time had been reached we scrubbed the grout lines by hand with a grout brush before scrubbing the whole floor thoroughly with a black pad fitted to a rotary machine. The cleaning solution soon became soiled with the released dirt and was removed the using a wet vacuum and rinsing with cold water. At this point it became apparent that the edges needed attention, the machine always struggles here so we used a stiff hand brush to remove the ingrained dirt and also some paint spots with the aid of a razor edged floor. Once we were satisfied we had removed all existing dirt and sealer we rinsed again thoroughly with clean water and a scrubbed with a deck brush several times to make sure we had removed all traces of cleaning product. The floor was then dried as much as possible using a wet vacuum and left to dry agreeing to return a week later to seal the floor. 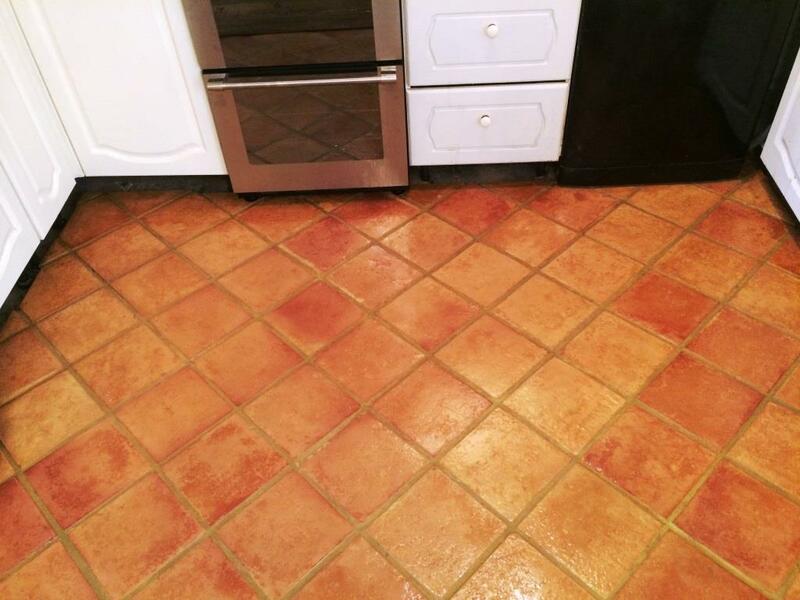 Upon our return we tested the floor was dry with a moisture meter, the test came back fine so we proceeded to seal the floor using six coats of Tile Doctor Seal and Go which works really well on Terracotta and adds a nice subtle sheen to the tile. The customer was so happy to have her floor back to the appearance when it was first laid and before leaving I give her some cleaning advice to help prolong the life of the sealer. It’s a fact that a lot of commercial tile cleaning products are designed for cleaning ceramic tiles and contain acid which slowly erodes the sealer so to maximise the life of the sealer use a low alkaline/neutral PH product such as Tile Doctor Neutral Tile Cleaner.